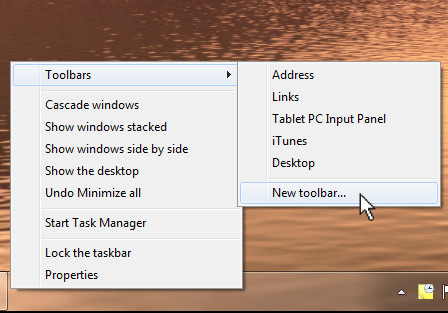 Many Windows users who were fans of the Quick Launch toolbar may now notice that this feature is no longer available on the redesigned task bar and Start menu in Microsoft’s latest OS, Windows 7. At least not by default. So, how can you restore the Quick Launch toolbar in Windows 7? Watch the video above, courtesy of Lynda.com, for instructions on how to get the Quick Launch toolbar back on your task bar, just the way it used to be. There are a few more steps involved compared to previous Windows versions, but this feature is still available. Then click “Select Folder,” which will now make the Quick Launch toolbar appear on the right-side of your task bar at the bottom of the screen. From there, you can adjust the appearance to match that of what you are used to (explained in the video at 1:30). That’s all there is to it. You have now resurrected the Quick Launch toolbar in Windows 7!